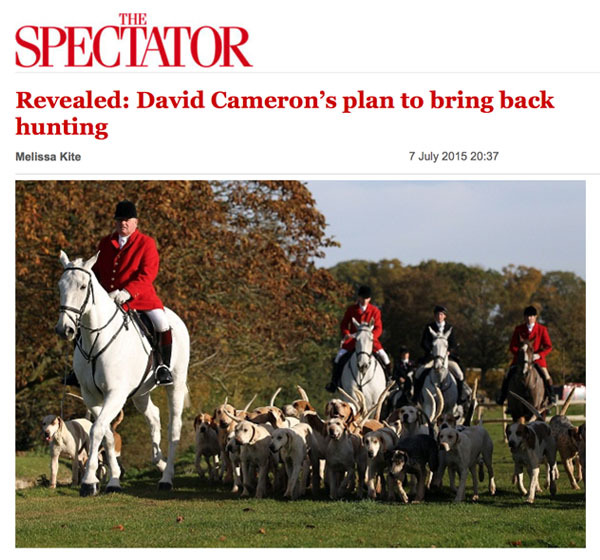 The Spectator has today published an article [Revealed: David Cameron's plan to bring back fox hunting] admitting that the Government, recognising they cannot win the “Free Vote on Hunting” that David Cameron promised, has given up on it, and is about to try to bring back legalised Fox Hunting through the back door. How incredible, when the country is still massively in debt, when there is still rising poverty in the UK, that our Government wants to prioritise bringing back blood sports. Word is that a ‘1922 Committee’ is to be convened probably this week to bring in a Statutory Instrument (SI), to increase the number of hounds that can be used in a so-called ‘pest control’ operation. Effectively this will completely smash the protection that the Hunting Act at present affords to foxes to prevent suffering. We need to make sure all decent people, and especially all decent MPs, understand what is at stake here. The Spectator article has two halves. The first tells us that the Government is now no longer confident that it can win a free vote on repeal of the Hunting Act, so it will attempt to legalise this barbaric behaviour by other means. The second half is a shamefully biased bit of propaganda telling us that such a move would benefit us all … and even benefit foxes, if they have mange!! Absurd and disgusting talk, and it seems likely that the Spectator has been fed this whole story to try to soften up the public – for the shameful act of sabotage to a law, which they are this morning saying is imminent. The intent of the proposed SI is to increase the number of dogs that English hunters can use to ‘flush out’ a fox to be shot, in the loophole situation in which at present just two dogs can be used, if the operation is deemed to be about ‘pest control’. So the blood hunts will be able to allow their full pack of hounds to run amuck, just like the old days. Who would be able to tell if they were ‘controlling’ a fox or just pursuing their old vile pleasure? Effectively this is the repeal of the Hunting Act under a different name. The so-called ‘Trail Hunts’ (of which many present government ministers have been members in the past) have all along insisted on using real fox urine to lay trails so that the dogs can follow a real fox ‘accidentally’ and rip it to pieces, while the hunters rub their hands with glee. This dishonesty has been going on ever since 2004 as a way of getting away with breaking the law. There is another kind of hunting – Drag Hunting – which has been going on for over 150 years. Drag Hunts use an artificial scent, so the dogs will never follow an animal, and there is no cruelty involved. Country folk have been enjoying this tradition for a long time, knowing they were not guilty of any cruelty, and long may they continue. On the other hand, the ‘Trail Hunters’ are all about causing suffering for pleasure and are clinging on desperately to their right to inflict pain. If this SI measure is to be used to bring back legalised abuse of foxes, it means the Government have decided that the goodwill of the Countryside Alliance is more important to them than the will of the British Public. Historically, Statutory Instruments have only been used to make a minor modification to a law in a non-controversial way. The idea that this device could be used to circumvent the will of the majority of the English people is actually an outrage and will be viewed by all decent folks as disgraceful conduct by any government, and an abuse of Parliamentary procedures. Whether or not the Spectator article is true, this is the time we must rally to rescue our wild animals – and, on the way, rescue our own Common Decency. It’s time to write to your MP – not just to say ‘vote against repeal of the Hunting Act’– because this vote may now never happen. What we need to write and say is … “I, as one of your constituents, demand that you, as our MP, vote against any attempt to bring back blood sports by any means, including subterfuge. Whether the attack on the Hunting Act is brought by fair means or foul, it must be resisted – or Britain will be heading straight back into the barbaric Dark Ages.” Well, use your own words! Talk to the FBI. In giving assent to animal cruelty, we are effectively giving consent to the abuse of humans too. The FBI’s files on animal abusers are the first place they look when they’re searching for a child abuser. The hunting of defenceless animals is a totem – a symbol of the need for a certain kind of human to exert their power and enjoy the feeling of cruelty. Never be fooled by the ridiculous claim that this is about ‘control of a pest’ – about ‘Vermin’. It’s now absolutely established that the fox hunts BREED foxes for their vile sport … this blasts all these claims out of the water. Foxes were introduced to the Isle of Wight in the 1930s purely for sport. Are they going to tell us hunting is necessary for ‘pest control'? And only last week we saw the pictures of 16 tiny fox cubs pitifully being held in a barn, and being fed by accessories to the local Hunt. It’s been well known for years this goes on, the poor creatures being held in bags or dustbins to be tipped out in a pitiful state to be pursued by the pack. The claim that any vicious ‘sport’ is justified by ‘culture’ – or ‘tradition’ – is also entirely specious. This line of reasoning can be used – and HAS been used, to justify anything from bear baiting and horse beating to slavery, and to Female Genital Mutilation. NO ! Tradition cannot be used as a justification for despicable behaviour. WRITE NOW to your MP … tell him or her you will not stand for skulduggery which will hurl us back into the Stone Age.